For years after I moved to Atlanta in 1987 I heard traffic reports on the radio that daily referenced "The Big Chicken." Having not seen it I assumed it was a piece of over-sized public art. I wasn't totally wrong. The Big Chicken was the brainchild of Stanley R. "Tubby" Davis, the owner of a burger joint that he opened in 1956. By 1963 the restaurant was in financial distress and Davis needed to do something to bring in business...The Big Chicken was hatched. The restaurant eventually was bought by Kentucky Fried Chicken (KFC) and in 1993 the Big Chicken underwent a major restoration—as a result of public protest of it being demolished. 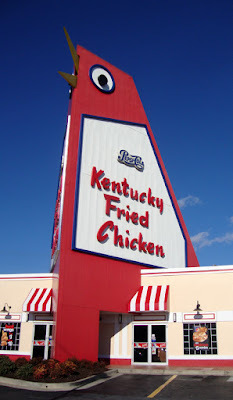 Next time you're in the vicinity of North Cobb Parkway and Roswell Road in Marietta, Georgia, have a gander at the 56-foot tall Big Chicken and its googly eyes and motorized beak. And this KFC has a gift shop! The Marietta Museum of History, six blocks west, also sells Big Chicken memorabilia.